HABITATS & CAGES :: Complete Habitat Kits :: Zoo Med Reptibreeze Chameleon Kit - SHIPS FOR FREE!! Home/HABITATS & CAGES/Complete Habitat Kits/Zoo Med Reptibreeze Chameleon Kit - SHIPS FOR FREE!! 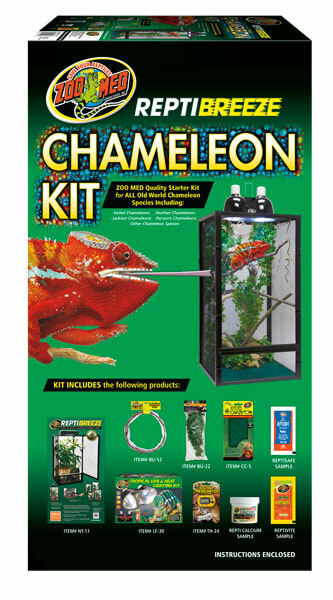 Zoo Med ReptiBreeze Chameleon Kit Starter Kit for all Old World Chameleons. Great for Veiled Chameleons, Panther Chameleons, Jackson Chameleons, Parson's Chameleons, and more! Everything you need to get started in one box. *Looking for a Reptibreeze Substrate Bottom Tray? Zoo Med's ReptiBreeze® Chameloen Kit is a great starter kit for new Chameleon owners. Have Ashley show you the steps on how to set one up.